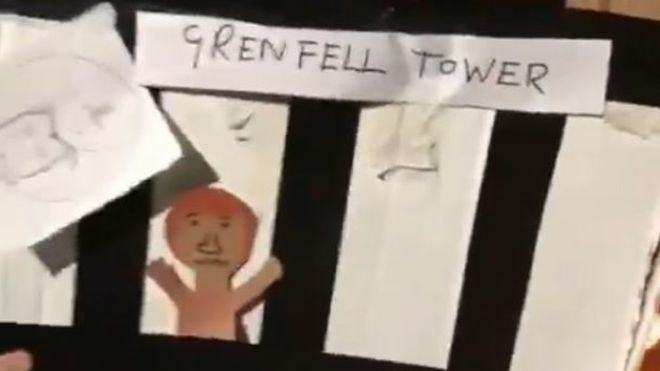 Six people have been arrested over a cardboard model of Grenfell Tower burning on Bonfire Night in someone’s private garden. Someone filmed the pre-medicated idiocy – the Tower was populated with paper faces stuck at the windows – and stuck it on WhatsApp. Lots of other people saw the video when it reached Twitter and Facebook, and became understandably upset. So six arrests have been made – that’s six more than have been arrested for any part in the actual fire in which 72 people lost their lives. The six have been arrested on suspicion of committing a public order offence. Which offence is unclear. It could be a hate crime, but, then, what isn’t? Under the Public Order Act, racially or religiously aggravated offences carry a prison sentence of up to two years, a fine or both. What is the sentence for being a bellend who made a despicable video? Is making an offensive joke in private a crime? Maybe Theresa May, the actual prime minister, who called the video “utterly unacceptable”, can advise? Burning effigies of people for a laugh. Artist Frank Shepherd puts the finishing touches to the Edenbrige Bonfire Society Celebrity Guy which has been unveiled as the model Jordan and featuring the faces of former husband Peter Andre and current partner Alex Reid. If found guilty, the media and judiciary will name them. And we can all realise that we’re reading about people mocking others who died in horrific circumstances because it’s a rare event – thankfully – and not an inspiration. Mr Smith and Mr Connell were arrested with Paul Bussetti, also from south Norwood, a 49-year-old man from Lambeth and a 55-year-old man from Beckenham. All are suspected of intentionally causing harassment, alarm or distress under section 4a of the Public Order Act.